More than any city I've visited, Yerushalayim has its landscape dotted with countless signs. The signs themselves are posted by people offering classes, advertising their clothes washing, seeking help, and warning people before entering religious neighborhoods. Today, while walking back from lunch, I saw that my neighborhood has the same famous as Meah Shearim. 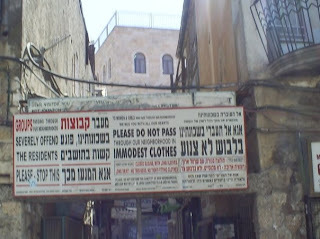 These signs are often photographed, and warn people passing through to not wear immodest clothing. Women are clearly asked to not wear short sleeve shirts, pants, or short skirts in the area, as the population is largely (if not completely) made up of ultra-Orthodox Jews. It shocked me when I saw the same thing in my own neighborhood, as I had obviously passed it many times and not noticed that it was there. The most common signs found posted to the walls of buildings at intersections are black and white posters announcing the ptira (death) of someone. If the person is relatively unknown, the posters are only found in the immediate area. If they are announcing the ptira of a well-known figure, the signs might be found all over the city. The reason for this, as well as the occasional cars driving around with loudspeakers announcing levaya (funeral) times and locations is because of the care taken for the dead. As we do not wish to prolong the suffering of a soul by being torn out of a body, and continuously witnessing the dead body laying here and there, we try to bury the person as soon as possible, preferably on the day of death. 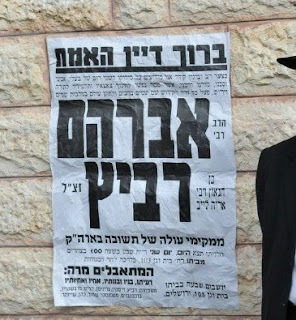 These signs were seen recently here in Yerushalayim upon the ptira of Rav Avraham Ravitz, a notable MK (member of the Knesset, or Israeli parliament) and one of the political leaders of the ultra-Orthodox political party. The same came again this morning, with the loss of a great member of the Jewish people. Sometime between last night and this morning, Harav Noach Weinberg, zt"l, was niftar (passed away). Harav Weinberg was the Rosh Yeshiva and founder of the famous Aish HaTorah yeshiva, which has yeshiva and outreach branches across the world. While controversial, Harav Weinberg is responsible for countless Jews returning to devoted, religious lives. For the past 50 years, this holy leader of the Jewish people led the kiruv (outreach) organization of Aish HaTorah, helping to bring Torah to all of the Jewish world. While addressing this weeks parsha (Torah portion), the holy Noam Elimelech notes that because Yosef (Joseph) followed on the path of his father Yaakov (Jacob), the holiness and capability of Yaakov was transfered to his son. This, says the Noam Elimelech, is the reason that while Yaakov's body was returned to eretz Yisroel (the land of Israel) for burial, Yosef continued to live in Mitzrayim (Egypt) and was initially "buried" there. When the Torah notes that Moshe (Moses) brought the bones of Yosef with him out of Mitzrayim, it says that Yosef told the Jewish people that through this, G-d would remember them. The Noam Elimelech takes this to mean that in the rememberance and merit of Yosef, the Jewish people would also be zoche (merited) to receive tremendous acts on their trek. Jewish tradition relates that when G-d was preparing for kriyas yam suf (the splitting of the Sea of Reeds), the angels told G-d not to help the Jewish people, as they were idol worshippers. (This is understood to mean that they did not believe in the fullness of Divine Providence, or hashgacha pratis.) However, we know that "the sea saw, and it split", meaning that it saw the coffin of Yosef, and Moshe, the leader of the Jewish people, who had also reached the level of Yosef and Yaakov. Because of the great devotion, spirituality, and level of Yosef and the new leader Moshe, the sea automatically split, because Creation knew that with the leadership of such a tzadik (righteous person), the Jewish people themselves would also be transformed. In the memory of such a great pilar of the Jewish world (Harav Noach Weinberg, zt"l), may we be moved to also dedicate ourselves to bringing the light of Torah to darkened lives, that we may all be zoche to see the ultimate and final redemption now, in our days. Skipping to the weekly parsha (Torah portion) of your post I would like to add my two cents. When Yaakov (Jacob) died it is written that Yosef (Joseph) attended to his fathers body and took care of all the arrangements that were required to bring Yaakov to Chevron (Hebron) where he was ultimately buried. The Gemorah (Talmud) in Mesechtas (tractate) Sotah, 13b, discusses the entire story that took place in great detail. The Gemorah wonders first why was it only Yosef that attended to Yaakovs body? Where were all the other brothers? The Gemorah replies that the brothers decided that it would be a greater honor for Yaakov to have Yosef attend to him because Yosef was a “Mishne L’melech”, a viceroy. They had decided that it would be a greater honor to have a leader of a nation show respect to his father than to have all his sons help with the preparations as well, thus teaching a valuable lesson that leaders should actually lead by example. Sort of like “follow me”, not “forward march”. The Gemorah then continues with the funeral procession that went from Mitzrayim (Egypt) up to Chevron. The Gemorah wonders why is it that when the entourage left to go from Mitzrayim to Chevron it is written that the first to follow the casket was Yosef, then the Egyptian dignitaries that wanted to pay homage to Yaakov, and only after that the rest of the sons of Yaakov. However on the return to Mitzrayim from Chevron, it is written that Yosef led the way, then came the sons of Yaakov, and at the end the Egyptian dignitaries. Why when they left to bury Yaakov did the dignitaries go in front of the brothers but on the way back Yosef’s brothers were in front of the dignitaries? What happened at the funeral that triggered the dignitaries respect for the brothers to insist that they, the brothers, go ahead of the Egyptians? The short version of the answer is that the Egyptian Dignitaries were not very impressed with the fact that the brothers allowed Yosef to do all the funeral preparations alone, and augmenting this was the troubling story of the brothers selling Yosef as a slave, they thought that Yosef’s brothers were not worthy of the honor of having the dignitaries walk behind them, so they insisted on leading the way in front of the brothers. Allowing themselves to learn from Yosef in following him, but insisting that the brothers still had a lot to learn, therefore leading the way for the brothers. At the funeral however through various different events that took place, and after noticing the honor that Yosef himself bestowed on his brothers the Egyptians came to realize the intentions of the brothers in allowing Yosef to go through the entire process alone was actually noble and their respect for the children of Yaakov grew immensely. And so they then allowed themselves to learn form the rest of the brothers as well, as it is written, that on the return to Mitzrayim, first came Yosef, then the brothers, and then the Egyptian dignitaries. When the brothers returned to Mitzrayim they began to get nervous that now that Yaakov was no longer there Yosef might want to take revenge against them for all the cruelty that the brothers put Yosef through. However when Yosef heard this he began to cry. He assured his brothers that he held no grudge against them and then beseeched them with the following: When the time came for the Bnei Yisroel (Israelites) to be exiled from Mitzrayim to Eretz Yisroel (Israel) The “Bnei Yisroel” must take his “Bones” up to Eretz Yisroel with them for burial just as he had done for his father. The Gemorah starts to analyze the words of Yosef and begins with the first part of his sentence, “The “Bnei Yisroel” must take”. Yosed did indeed beseech the entire nation to take his bones up, but in the end it was Moshe (Moses) that busied himself with the task of seeing to Yosefs “bones” why didn’t the tribe of Yosef insist on paying respect to Yosef and do it on their own? Furthermore was the entire nation so busy with taking the booty from the Egyptians (it was in the middle of the darkness plague at that time) that none of them remembered what Yosef had asked, other than Moshe? The answer lies in the end of the sentence “ As I have done for my father”. The tribe of Yosef thought that it would honor Yosef to allow all of the Bnei Yisrael to partake in the deed. While the collective Bnei Yisroel thought that the honor would be greater by again allowing a leader to lead by example and busy himself with Yosef’s casket. When the sea refused to split in the merit of the Bnei Yisrael alone, you noted “the sea saw, and it split.” It saw the coffin of Yosef who led by example, and it saw the new Leader, Moshe, and it saw the deed that Moshe had done, to gather Yosefs coffin at the behest of the rest of the Bnei Yisroel and it then realized that with a leader that led by example and a nation that demanded the example to follow by this nation was indeed worthy of having the sea split, and so it split. Since a corpse described as bones implies that decomposition as occurred, Yosef refers to himself as bones to punish himself. When the brothers came before him, still not knowing that he was their brother, and pronounced that they were the “sons of Yaakov, your servant” they were trying to honor the viceroy of Mitzrayim by calling Yaakov a servant. Yosef on hearing his father referred to as his servant said nothing to correct them. One could say, and there are many other commentaries that subscribe to this opinion, that Yosef merely wanted the prophetic dreams he had had earlier to be fulfilled. When Yosef had the dream of the stars and the moon bowing to him his father Yakkov declared in mock anger “"What is this dream you dreamt? Shall I and your mother and brothers come and bow down to you?" ... ,but the Torah says, “his father awaited it.” (Bereishit 37:11) And so when Yaakov was referred to as Yosef’s servant the Prophecy was fulfilled, as were all other prophetic dreams that Yosef had. However the one time that Yaakov was referred to as a servant should have been enough, Yosef allowed for several other declarations of Yaakov being his slave, and so he thought that he should be punished. As a leader he felt that he should have learned from his father who went out of his way and inconvenienced himself by not allowing Leah to be embarrassed. When he was tricked into marrying Leah instead of Yosef’s mother Rachel, Yaakov worked many more long years and then married Rachel. He did not insist on a divorce. And so Yosef referred to himself as “Bones”. Bones are the skeletal make up of a person that he gets from his parents. He was also hinting to the noble and selfless act that Yakkov , his father had displayed when marrying his mother Rachel. The Gemorah then goes on to quote that Yosef lived ten years less because he had allowed Yaakov to be called his servant 10 times. This seems a bit harsh. Why should he be punished twice? Firstly, by referring to himself as bones, and secondly, by losing ten years of his life? The answer that can be given is that Yosef was only punished once. He lost ten years of his life. Then why did he refer to himself as bones? The answer may be that Yosef did not intend to punish himself by calling himself bones, he merely wanted to teach the future generations a lesson. The hebrew word for “bone” is “eitzem”. This root is also used in the Hebrew word “Atzmiyus” which means sense of self. He was trying to teach the future generations that leaders MUST lead by example just as he as a leader had gotten his “Atzmos” (bones) genetically from his father and mother, he had also gotten his “Atzmiyos” his sense of self, his sense of right and wrong, his sense of leadership from his father. And he wanted the future generations to remember that! Thus his referring to himself as “Bones” was not a punishment but rather a lesson for all of us. The “SIGN” of a true leader is one that leads by example. It is also important that the followers of the leader encourage him to do so, and wholly follow by the examples that he sets forth. I believe that this is as prevalent today as it ever was. To quote the closing of your post “May we be moved to also dedicate ourselves to bringing the light of Torah to darkened lives”, and might I add that we be blessed with leaders who’s selfless examples can shed some light on the proper path in this sometimes dark journey we call life. I feel very forunate that your Mom shared your Blog with me. I had no idea that I would be so moved. You have a natural talent for telling a story. I feel as if I am taking the walk right along with you.